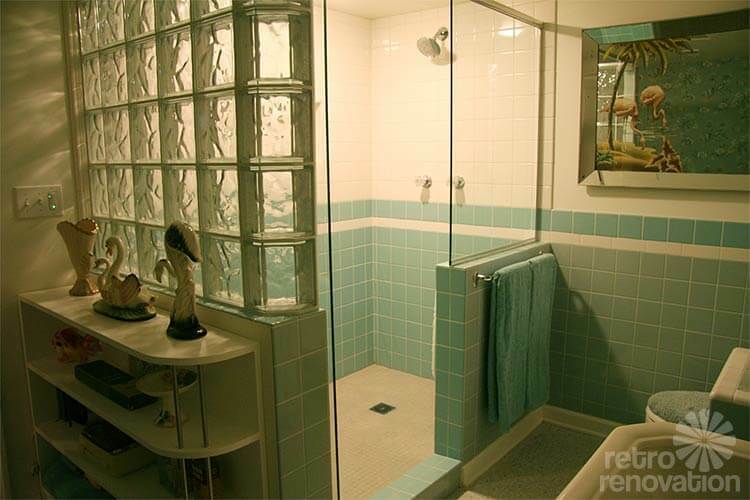 Matt has been constructing this blue and gray tiled bathroom in his 1959 home — all from scratch — oh my — it’s fabulous! Now, it’s time to choose wallpaper. He’s found a contender but sends in this question: Does his wallpaper choice have an authentic midcentury look? I opine. I’ve been recreating a blue / gray bathroom since early last year, and I’m finally at the point where we choose wallpaper. 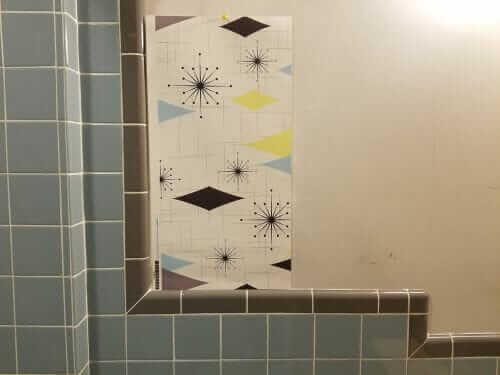 We found a pattern we really like that has a blue / gray scheme that’s similar to our tile and fixtures with a yellow accent. You would have to see the colors (I have a couple of pictures) but I’m wondering how authentic this might be? I don’t see very many blue bathrooms, let alone blue with a hint of yellow anything mixed in there. For what it’s worth If we go with this I’m thinking white towels so it would be just a pop of color. Our goal is something that looks like it’s been there since the house was built in 1959. It’s basically down to wallpaper, building the hamper, someone changing our salvaged green bathtub to blue, and small details so we’re getting really close to the end! The bathroom is changing quickly though, for example if our two year old cooperates the countertop may be tiled by the end of the weekend. Likewise the tub I’m hoping can be enameled in blue soon. 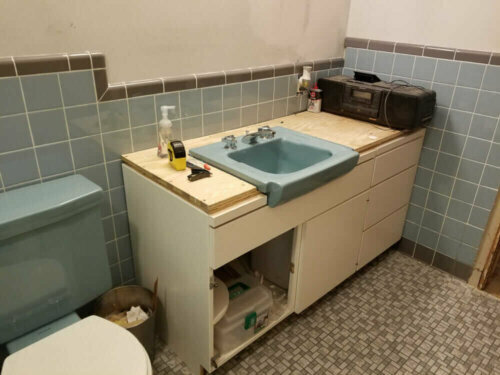 The tile and plumbing supply fixtures are new. Cabinets, lighting and other fixtures are salvaged. 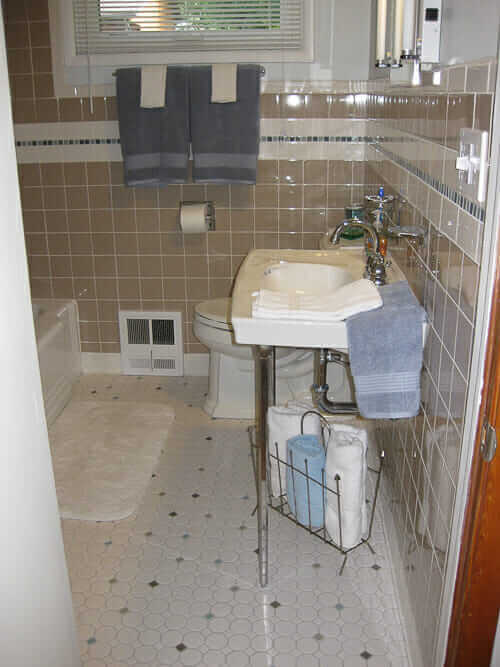 We’ve used a lot of the resources available here for tile and fixtures, by the way. We’re definitely glad all of it was available. 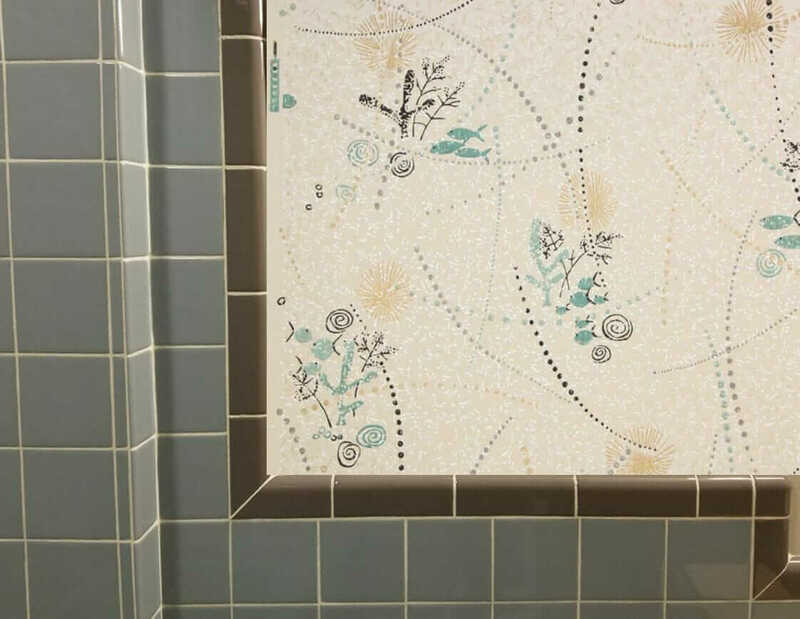 Fun wallpaper, Matt, and what a job on that bathroom — kudos! 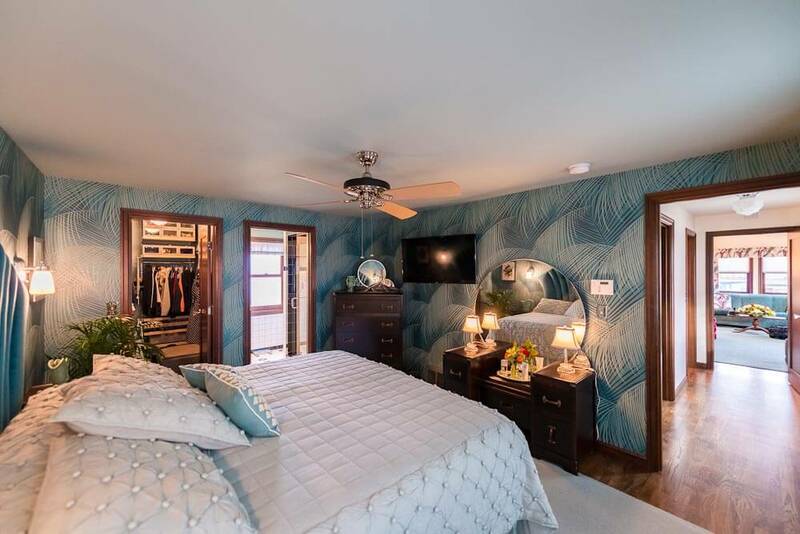 But to answer your question(s) directly: (1) No, I do not think your wallpaper choice has the look of actual wallpaper you would have seen in the 1940s, 1950s or 1960s or even earlier. My reasons are technical rather than color-related. And (2) The colors are fine — except for that bright white field. Old paper was printed using actual rollers — actual ink laid down, layer after layer until the desired design was achieved. The paper stock also was — pretty paper-y — they can be tricky to install for that reason — they may tear or otherwise be brittle or fragile. Few bright (blue) whites / mostly yellowed pinked off-whites. Bradbury’s Atomic Doodle in Turquoise has on off-white field in a smaller pattern, and it’s hand-printed. Many of today’s widely available wallpapers, on the other hand, are digitally printed on paper that is more water-fast. That means, you don’t see, so finely, the laid-down layers of paint. The finish is more washable — typically a vinyl coating with satin finish; this also makes it stronger so the paper is easier to install. Regarding the aesthetics: The patterns may be larger — as with yours. So… If you want a paper that looks truly authentic to the time — if you want time-capsule look — look for vintage or a paper that’s still printed with real inks using rollers or similar technology. 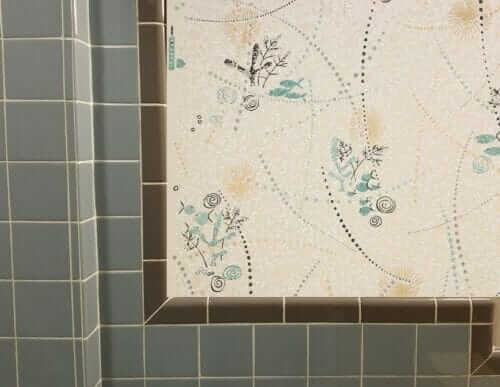 ALL THAT SAID, unlike tile — which is forever — wallpaper is jewelry — it can be changed out at far less cost and hassle. And, it folks did change their wallpaper out over time. So if you like the “new retro” aesthetic and don’t mind if a super-expert knows in a glance that it’s not true “time capsule”, go for it! 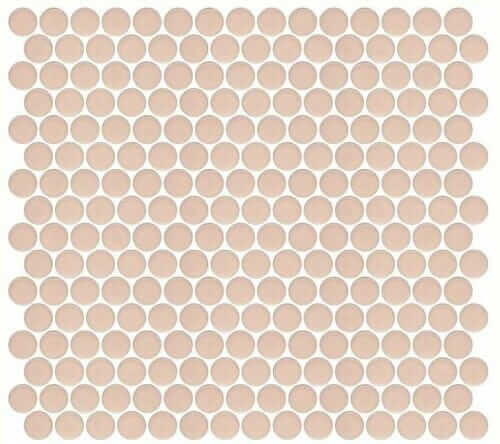 I am the designer of the wallpaper that Matt originally chose. 1. The wallpaper is sideways. The diamonds should be tall and not wide. 2. The wallpaper is printed at Spoonflower where artists like me have control over the colors and design. If the white is too white, all a person has to do is contact me through Spoonflower and ask for a muted beige or a light grey background, or whatever color is to the liking of that customer. Changes for these kind of things are easy peasy. 3. I’m in the pool with those that say you don’t always have to do vintage everything. I like to mix it up, personally. That’s why I started doing art. I didn’t like what was available to me, vintage-wise, so I created vintage-inspired pieces (paintings at that time) to go with my authentic 1950s-60s furnishings which at the time was in a very 1980s mobile home, btw. 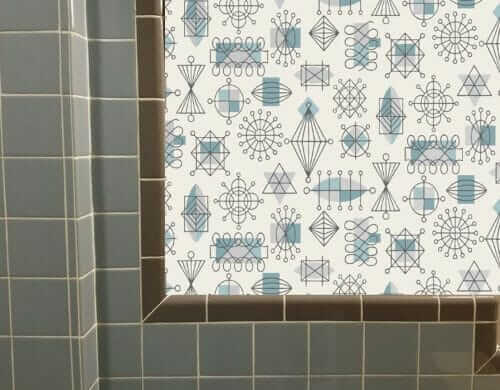 Over the years, I learned how to create art that could be used for fabric and wallcoverings that stay true to my mid century inspried aesthetic. I understand if you have a 1953 home and you feel you must fill it with anything and everything from 1953 but there are some of us who like to mix it up and there’s nothing wrong with that. What I find funny is how some are praised for this while others are shamed. No shame here. Hi Tonya, Thanks for your comment and congrats on all your great work as an artist. Our goal is something that looks like it’s been there since the house was built in 1959. As such, I recommended true vintage. I agree, there are no police here saying you can’t or shouldn’t mix old and new. In fact, I spotlight many midcentury “style” products.